Grapevine, TX (Feb. 25, 2019)– Grapevine Faith Christian Schoolwill see nearly 1,600 pounds of plastic waste (38,000 water bottles) saved each year, thanks to the leadership of two students who saw a need and were empowered by their science teacher and the school to bring their plan before city officials. 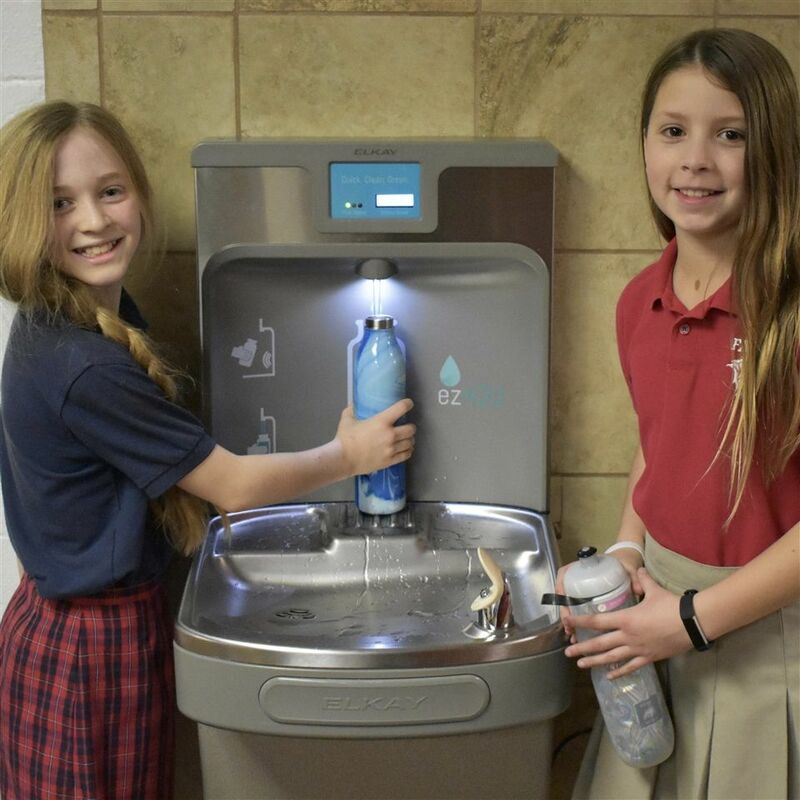 Arden Cope and Jenna McCully, two fifth graders at Grapevine Faith, wanted to make a difference on their campus by encouraging more recycling, starting with the amount of plastic bottles being used throughout the campus. They brought their plan to science teacher Heather Lauden, who helped them write a grant proposal for “The Community Grants Program” through Keep Grapevine Beautiful. “We wanted to find a solution for all of the bottles and cans that we saw being thrown away and Mrs. Lauden said that Keep Grapevine Beautiful had a grant program that supported projects involving beautification, litter prevention and waste reduction – so we applied!” said Arden Cope, student at Grapevine Faith Christian School. “Our teachers encourage and challenge us to lead in our community by finding solutions to the problems we face, and that’s exactly what we did,” said Jenna McCully, student at Grapevine Faith Christian School. In November 2018, Lauden, Cope and McCully presented their grant proposal to the Keep Grapevine Beautiful Board of Directors, to which they were awarded a $2,300 toward their student-driven waste reduction program “Reduce, Reuse, ReFILL!” Grant funds were used to purchase two filtered and refrigerated Elkay EZH20®water bottle fillers for students to refill their personal water bottles in place of plastic water bottles. Bobby and Karla Beck, owners of Bobby Beck’s Lewisville Volkswagen, heard about the excitement that the water fillers brought to the school and immediately stepped in to match the grant contributions for two additional water fillers. As a result, both of the Grapevine Faith campuses will now enjoy refilling stations and expect to save more than $12,000 in water bottle costs over the next two years.